Do you ever have those days when you really want to get in a good workout, you need to sweat, and want to work hard, but then you get to the gym and you have no energy or motivation for much more than a crawl? I do – quite often actually, and I can always count on running to get me started on those days. For some reason, I feel more motivated, stronger, and more excited about getting in my workout when my heart rate is up and I’ve already worked up a bit of a sweat. Rather than running a few miles on the treadmill to do that, I like to start with a short but speedy interval and then hit the weights. 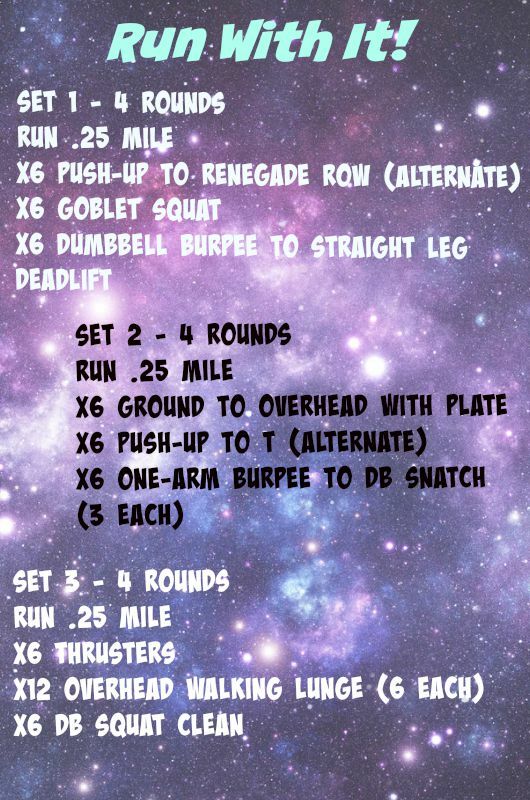 Below is one variation of workout you can do when you’re having one of those days. You’ll start with a run, and incorporate it throughout, but also get in some good strength training. The goal here is to move as quickly as possible through each round with good form – keep your heart rate up! If you’re doing it correctly the run will feel like active rest! Pick a run speed that would be a challenging mile – you’ll only be doing quarter mile splits for this workout. Choose weights that are challenging – you’re only doing 6 reps, so no need to go light! You’re done! You got in a sneaky 3 miles and you’ve definitely worked up a sweat. Don’t you always feel better after a workout? I know I do, but sometimes it takes a little extra push.